Where I live there are is always a chorus of birds. Sometimes they are so loud they wake me up in the morning! 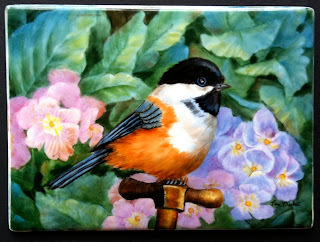 One of my favorites is the black capped chickadee. This little bird hangs out with a little gang of birds who frequent my feeders. Along with the chickadees, there are titmice, and nuthatches. I don't know who is the boss of the gang! But they all move along together. This is on a little 4x6 porcelain tile.